The User Defined Functions in SQL Server are like functions in any other programming language that accepts the parameters, performing complex calculations, and returning the result value. System Functions: All the built-in functions supported by the Server are called as System functions in Sql Server. We don’t have to bother about the logic inside them because they cannot be modified. For example, Mathematical Functions, Ranking Functions, String Functions, and so on. Scalar Function: It is a function that return single value. Generally, we have to define the function body between BEGIN … END block but for inline scalar function you can omit them. We can use any SQL data type as the return type except text, image, ntext, cursor, and timestamp. 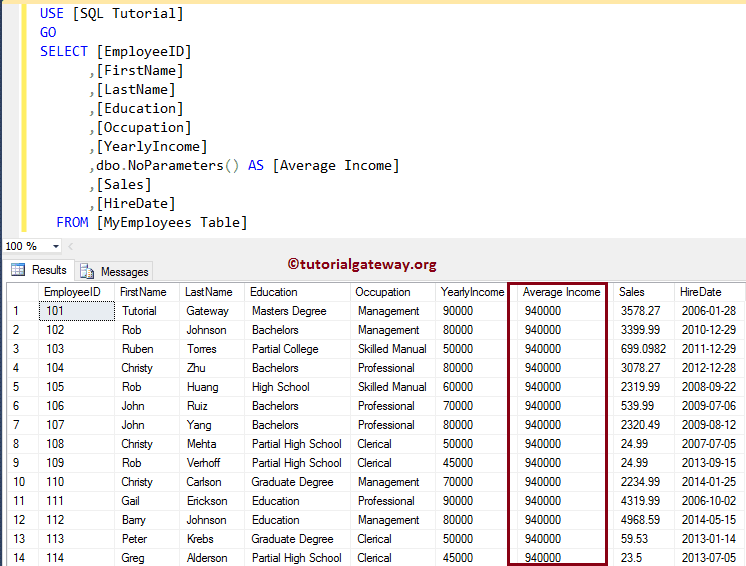 Table Valued Functions: It is a user defined function in SQL Server that return a table. Multi Statement Table valued Functions: This function also returns the tabular result set but, unlike the inline table valued function we can use multiple select statements inside the function body. User defined functions in Sql Server prevent us from writing same logic multiple times. Within the Database you can create the function once, and call it n number of times. SQL user defined functions reduce the compilation time of query by catching the execution plan and reusing them. This SQL user defined functions can help us to separate the complex calculations from the regular query so that, we can understand and debug the query quicker and better. 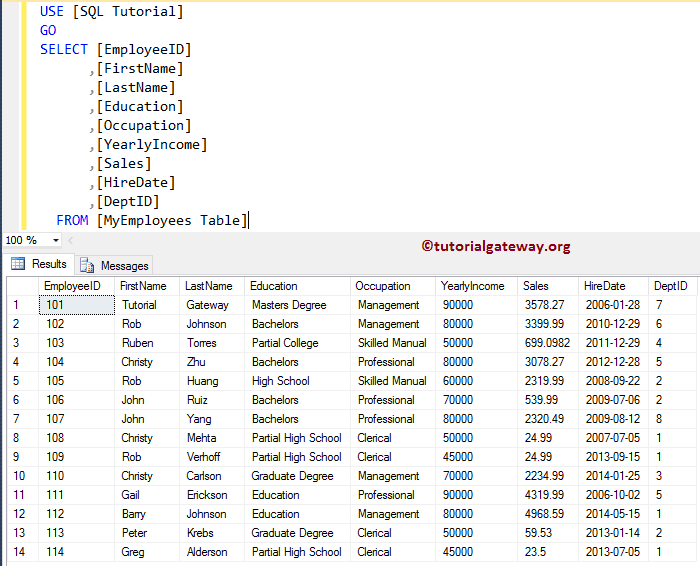 SQL server Functions can be used in WHERE Clause as well. By this we can limit the number of rows sent to the client. Data Type: Please specify the data type of return value. For example, VARCHAR, INT, FLOAT etc. Function_Name: You can specify any name you wish to give other than the system reserved keywords. Please try to use meaningful names so that you can identify them easily. Function Body: Any SQL query, or any complex mathematical calculations you want to implement in this particular function. 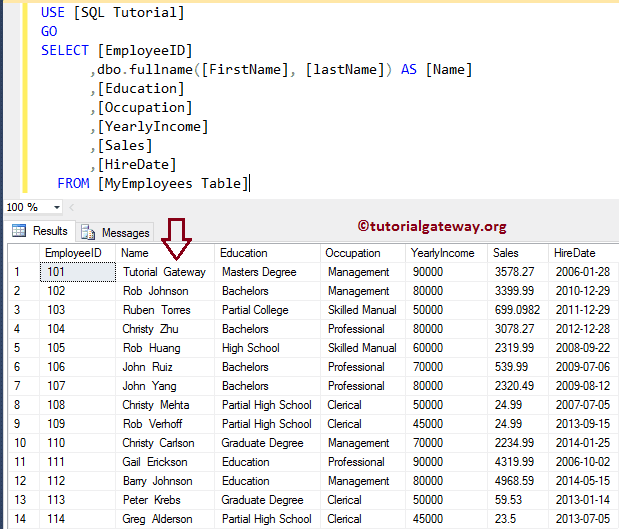 In this article we will show you, How to write different types of User Defined Functions in SQL Server with example. 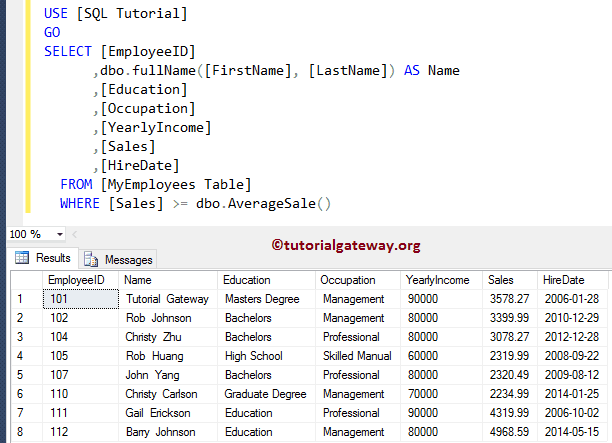 For this demonstration, We are going to use [MyEmployee table] and [Department] table present in our [SQL Tutorial] Database. TIP: Please refer Alter User Defined Functions in SQL Server article to understand, How to Rename, Modify, or Delete UDFs. The Scalar User defined functions in SQL Server are very useful when you want to return a single value as the resultant. For example, total sales, or total investments, total loss, or total expenditure etc. 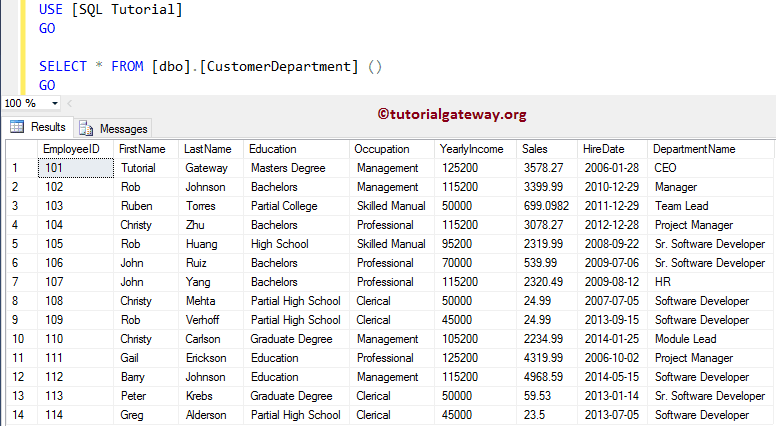 In this simple SQL scalar function example we will show you, How to create the Scalar function without any parameters. From the below query you can observe that, we are summing the Yearly Income of the MyEmployee table. 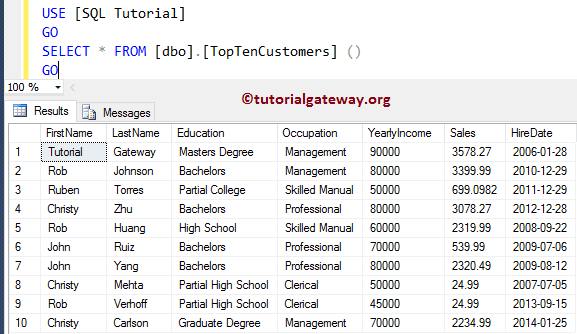 In this example we will show you, How to create SQL Scalar function with parameters. From the below query you can observe that, we are concating First name and Last Name. NOTE: We are using SQL SPACE function to provide the space between the First name, and last name. 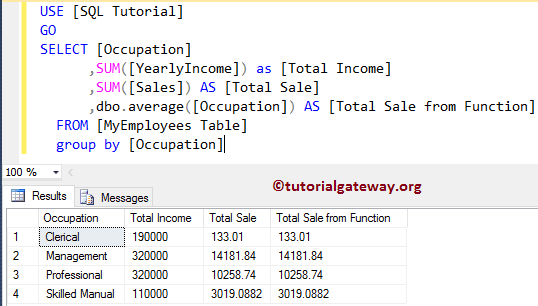 The following SQL scalar function where clause example will accept the var char as the parameter, and finds the sum of the Sales amount, whose Occupation is equal to the parameter that we pass. In this simple example we will show you, How to create a SQL Inline table valued function without any parameters. From the below query you can observe that, we are selecting top 10 records from the MyEmployee table. 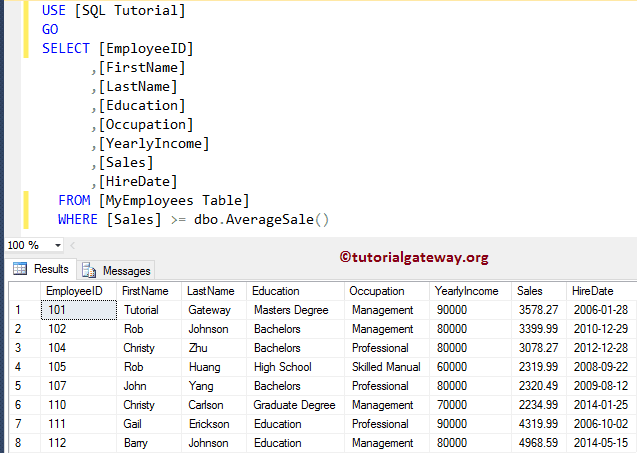 This Sql Server functions example will show you, How to create an SQL Inline table valued function with parameters. From the below query you can observe that, we are selecting the records from the MyEmployee table, Department table using INNER JOIN, whose Occupation is equal to parameter that we pass. The Sql Server Multiple select table valued functions returns the tabular result set. However, unlike the inline table valued function we can use multiple select statements inside the function body. In this Sql Server Multi select table valued function example will show you, How to use Multiple statements in one User defined function. Next, we are inserting the records from [MyEmployee Table], and [Department] table into @customers table variable. Next, we are updating the Yearly income of all the customers present in the @customers table variable, whose yearly income is greater than the average sales. In this example, we will show you, How to use multiple User defined functions in single SELECT Statement. 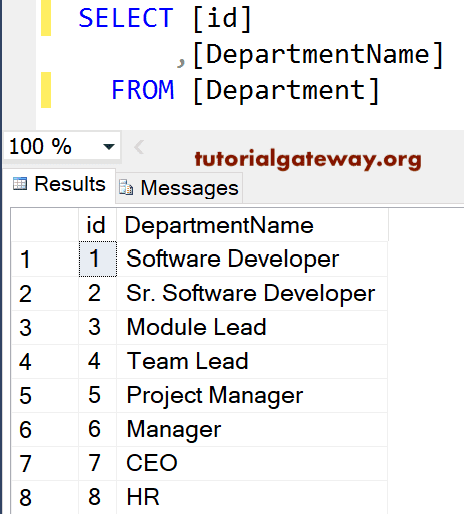 In this simple Sql server functions example, we will show you, How to nest or insert one User defined function inside another User defined function in Sql Server. We cannot use the User defined functions in Sql Server, shortly called as UDF in SQL to modify the database state. SQL UDF can not return multiple result sets. 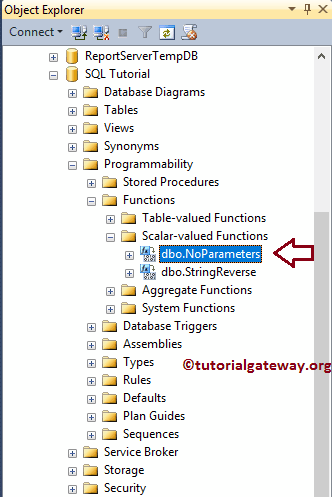 The SQL User Defined Functions does not support the temporary tables, but it will allows Table variable.